With triple the pine oil power, PINALEN® Original Multipurpose Cleaner can be used throughout your house—indoors and out—to freshen, clean and degrease. PINALEN® Original Multipurpose Cleaner brings out the best in every room. From baseboards to laundry, bathroom to garage—there’s no place it can’t go. Clean dust, dirt, grease, and stains from floor to ceiling. Remove stubborn and unwanted aromas from drains, garbage cans, dirty mops, pet areas, or automobiles. Remove oil and grease from all kinds of surfaces, including metal, tile, vinyl and linoleum. Mix 3 tablespoons (1 1⁄2 fl. oz.) of PINALEN® Original Multipurpose Cleaner in 1 qt. (32 fl. oz.) of water, apply, scrub with a sponge, and rinse. Mix 3 teaspoons of PINALEN® Original Multipurpose Cleaner in 1 1⁄2 cups (12 fl. oz.) of water, apply, let stand for 5 minutes, scrub, and rinse. Mix 1⁄4 cup (2 fl. oz.) of PINALEN® Original Multipurpose Cleaner in a half gallon (64 fl. oz.) of water, apply, and rinse. Mix 2 tablespoons (1 fl. oz.) of PINALEN® Original Multipurpose Cleaner in 10 cups (80 fl. oz.) of water, apply, clean, and rinse. Mix 3⁄4 cup (6 fl. oz.) of PINALEN® Original Multipurpose Cleaner in a gallon bucket of water, insert mop, let stand for an hour, scrub, and rinse. Mix 1⁄4 cup of PINALEN® Original Multipurpose Cleaner in half gallon of water (64 fl. oz. ), and apply. Mix 1⁄4 cup (2 fl. oz.) of PINALEN® Original Multipurpose Cleaner in half gallon of water (64 fl. oz. ), apply, and clean. Mop with a solution of 1 cup (8 fl. oz.) of PINALEN® Original Multipurpose Cleaner in 1 1⁄4 gallons (160 fl. oz.) of water. Mix 1⁄2 cup (4 fl. oz.) of PINALEN® Original Multipurpose Cleaner in 10 cups (80 fl. oz.) of water, apply, clean with a cloth. Mix 1⁄3 cup (2 1⁄2 fl. oz.) 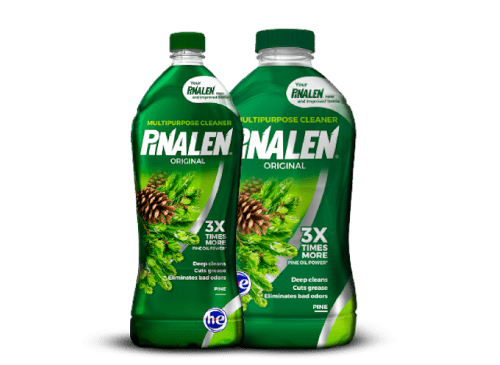 of PINALEN® Original Multipurpose Cleaner in half gallon of water (64 fl. oz.). Pour into the toilet bowl. Scrub with a brush and flush. Mix 1⁄4 cup (2 fl. oz.) of PINALEN® Original Multipurpose Cleaner in a half gallon (64 fl. oz.) of water, apply, and clean. Add 1 cup (8 fl. oz.) of PINALEN® Original Multipurpose Cleaner per load in washing machine. Mix 1⁄4 cup (2 fl. oz.) of PINALEN® Original Multipurpose Cleaner in one gallon (128 fl. oz.) of water, apply to spot with a clean cloth, and blot dry. Mix 2 tablespoons (1 fl. oz.) 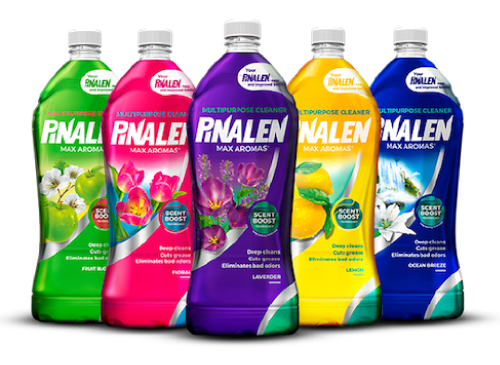 of PINALEN® Original Multipurpose Cleaner in 5 cups (40 fl. oz.) of water, let soak for 10 minutes, scrub, and rinse. Add 1⁄4 cup of PINALEN® Original Multipurpose Cleaner to a half gallon of water, apply and clean. Dilute 1 1⁄3 cup of PINALEN® Original Multipurpose Cleaner in a half gallon of water, then wipe down hard surfaces around the area in which your pet sleeps. For metal, dilute 1⁄4 cup of PINALEN® Original Multipurpose Cleaner in a half gallon of water; for resin furniture, dilute 1 fl. oz. of PINALEN® Original Multipurpose Cleaner in 80 fl. oz. of water. Mix 1⁄4 cup (2 fl. oz.) 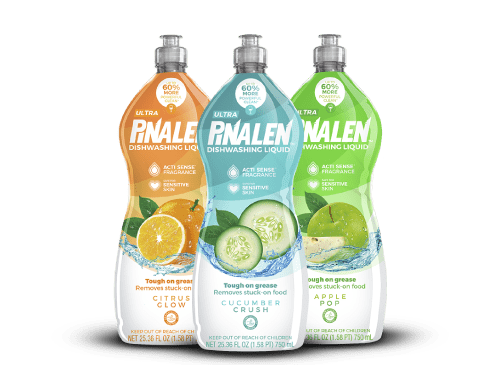 of PINALEN® Original Multipurpose Cleaner in 10 cups of water (80 fl. oz. ), apply, scrub, and rinse. Apply PINALEN® Original Multipurpose Cleaner in full strength to the spots, lightly scrub, then hose down. Add ¼ cup of PINALEN® Original Multipurpose Cleaner to a half gallon of water, apply and clean. For metal, dilute ¼ cup of PINALEN® Original Multipurpose Cleaner in a half gallon of water; for resin furniture, dilute 1 fl. oz. of PINALEN® Original Multipurpose Cleaner in 80 fl. oz. of water. TERMS | PRIVACY © 2018 AlEn - All Rights Reserved.